Ross County chairman Roy MacGregor is a man who has always trusted his instincts. They have served him well in business and in the equally competitive world of football at his beloved Staggies. MacGregor has dedicated decades to building the foundations that have taken County from the Highland League to a top-flight team and national cup winners in Scotland. But it has not been a smooth road, with County left reeling last season by relegation from the Premiership for the first time in the club’s history. MacGregor saw the writing on the wall early with the disappointing tenure of Owen Coyle failing to reap the rewards of top-flight safety he craved. A change of manager was the easy part but deciding what course to plot for the short and longer-term future was more difficult. The chairman took the bold option of promoting from within when he appointed two untested coaches in Stuart Kettlewell and Steven Ferguson. They are County to the core, with an association to the club that stretches back years, from their days as players to academy coaches. MacGregor decided it was time to try something new and gave the rookies a chance not just to shape the first-team squad but club’s youth conveyor belt. Despite Tuesday’s 1-0 defeat at Dundee United County are well on the way to regaining their place in the Premiership as they lead the Championship by eight points with eight games remaining. They are also favourites for Saturday’s IRN-BRU Cup final against Connah’s Quay Nomads of Wales at Caledonian Stadium in Inverness. It is a healthy position but MacGregor is not ready to pop the champagne corks. The County chairman said: “We have had the worst season I can remember in terms of injuries and the way the team has stood up to that has been fantastic. “I’ve been hugely impressed by the spirit within the dressing room and the leadership shown by the coaches and the senior players throughout all the setbacks. 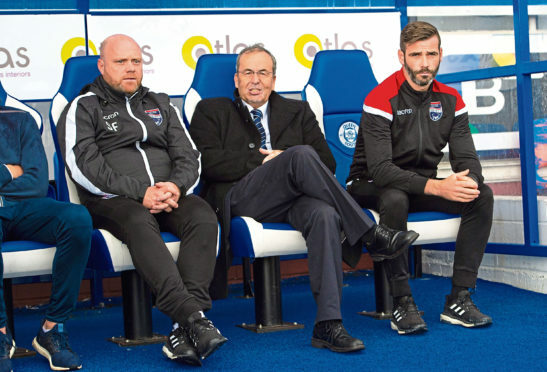 “I was worried at the start of the season how the team would adjust to relegation but on and off the park the adjustment has gone really well. “We have continuity behind the scenes and we were conscious of not wanting to rip the club apart following relegation last summer. MacGregor knows he took a risk but it is one he believes is paying dividends on and off the pitch. He said: “The leadership comes from the management team. Steven was my first professional signing for Ross County while Stuart has been here for 10 years. “They have strong connections to Ross County as do Richie Brittain and Brian Irvine. “Don Cowie and Liam Fontaine are at the start of their managerial careers and they have the drive and desire to do well at Ross County. “Don knows the club inside out while Liam has bought into the club ethos from the day he arrived here. “We’ve had to build that from within during our time in the senior leagues. “It’s gratifying to see former players become important coaching influences at the club but a little sad that it has taken 25 years for our academy structure to mature. “We’ve made real strides on that side of the club in recent years and we feel we are well down the road to having the academy structure and conveyor belt of homegrown talent we’ve worked for. “Steven and Stuart are leading those efforts after coming through the academy coaching structure to first-team level.